The province of Antwerp became a centre of first silver and then the diamond markets; today, its capital is still the world’s greatest diamond centre. Antwerp shares a border with the Netherlands. With 1.7 million inhabitants, it is the most populous region in Belgium. 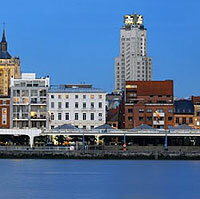 It is divided into three administrative districts: Antwerp, Mechelen and Turnhout. Antwerp is the country’s most productive region, with the highest number of business establishments. It also owes much of its strong economy to its North Sea port on the Scheldt River. The province is also one of Belgium’s tourist hotspots. One place growing in popularity here is the swamp region of the Kempen (Campine) in the eastern part of the province, which has become a popular camping and hiking destination. The Kempen has large swaths of heaths, pastures and marshes, and significant coal deposits have been found here. Antwerp’s capital, the city of Antwerp, has been named one of the world’s top ten trendiest places, and is one of the world’s great cosmopolitan cities. The capital city of Antwerp has a fashionable, sophisticated and multicultural atmosphere; an international travel magazine even named it one of the top ten trendiest places in the world. It is a city of luxury hotels and the ever-busy bars, clubs and cafés of its sparkling night life, of designer boutiques and international cuisines. It is a city of great culture—the home of the great artists Rubens, Van Dyck and Bruegel—with protected monuments and old historical buildings lovingly preserved. Antwerp’s long artistic heritage is still relevant today, particularly in the fashion world. The city’s Royal Academy of Fine Arts is one of Europe’s most prestigious fashion institutes, and its avant-garde designers push the envelope of fashion innovation. Antwerp has a population of 472,000, though the total number of residents of the larger metropolitan area runs about two and a half times that. Antwerp owes its economic position to the river Scheldt. For one thousand years the city’s major commercial asset has been its international port, the second largest in Europe after Rotterdam. It sprawls for 13,500 hectares, with a total of 350 kilometres of roads inside the complex. In the port area are warehouses, terminals, ships, bridges and locks as far as you can see—a huge contrast to the trendier parts of Antwerp that most people see. Another major economic force for 600 years has been Antwerp’s diamond industry, dominated by the city’s large and powerful Hasidic Jewish community. There are about 1,500 diamond companies in the city centre alone, and 4 of the world’s 25 diamond exchanges are in Antwerp. The city is the largest diamond market in the world. 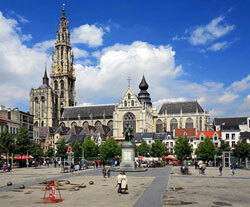 Mechelen, also known as Mechlin in English or Malines in French, is part of the urban-industrial Brussels-Antwerp area. It has the advantage of being close to both great cities and having a more affordable cost of living. The city is mostly associated with the production of the delicate Mechlin lace, famous for its beautiful, fragile intricacy and long favoured by royalty. Mechelen has many monuments and cultural attractions, including the imposing 13th century St. Rumbold’s Cathedral and the medieval Brusselpoort, the last remaining of Mechelen’s original 12 city gates. Mechelen is also an important centre of higher education in Flanders. There are some housing development projects underway in Mechelen, with the aim of reducing the number of old and disused properties and renovating them for use, and creating, maintaining or rehabilitating residential areas.